This article is about Charles Bukowski's novel. For other uses, see Factotum (disambiguation). 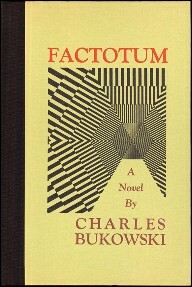 Factotum (1975) is the second novel by American author Charles Bukowski. Set in the 1940s, the plot follows Henry Chinaski, Bukowski's perpetually unemployed, alcoholic alter ego, who has been rejected from the World War II draft and makes his way from one menial job to the next (hence a factotum). Chinaski drifts through the seedy city streets of lower-class Los Angeles in search of a job that will not come between him and his first love: writing. He is consistently rejected by the only publishing house he respects, but is driven to continue by the knowledge that he could do better than the authors they publish. Chinaski begins sleeping with fellow barfly Jan, a kindred spirit he meets while drowning his sorrows at a bar. When a brief stint as a bookie finds him abandoned by the only woman with whom he is able to relate, a fling with gold-digging floozie Laura finds him once again falling into a morose state of perpetual drunkenness and unemployment. Factotum was adapted into a film of the same name in 2005, directed by Bent Hamer and starring Matt Dillon, Lili Taylor and Marisa Tomei. This article about an autobiographical novel of the 1970s is a stub. You can help Wikipedia by expanding it. This page was last edited on 18 August 2018, at 18:25 (UTC).